Dorri McWhorter, CEO of the YWCA of Metropolitan Chicago, shares how she has brought a business mindset to energize a 140-year-old nonprofit organization. 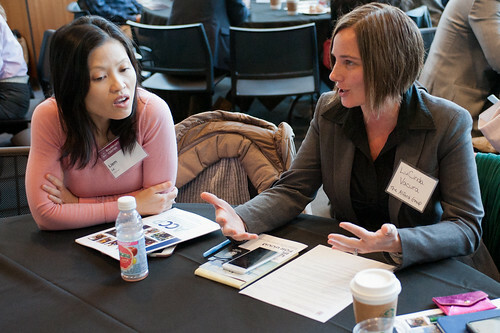 Chicagoland leaders gathered at Leading Business for Good to discuss how business can tackle social issues and how business schools can better equip students with the skills to do well and do good in their careers. Evans said, “Intentionality and the personal definition of success are critical.” He recommended defining what success looks like at each stage of your life, including students defining educational success while they are in school. The panelists agreed that there will always be tension between business and social impact work. The tension can play out in large decisions, as well as in small, tactical decision-making such as word choice. “It’s a matter of asking the right questions, engaging in a dialogue, and understanding what the parties are looking for,” Nordmeyer said. Organizations should seek to create a win-win situation for all parties. McWhorter spoke about how YWCA Chicago always looks at what partnerships they can develop that will support their mission. Their business integration strategy has led them to numerous successful partnerships. For example, YWCA formed a partnership with the rideshare company Uber to support its mission to economically empower women. YWCA drove female driver recruitment in Chicago, encouraging women to earn money through the Uber platform. Chicago now has the highest percentage of female Uber drivers in an urban market. According to McWhorter, YWCA looked beyond the surface and saw how the partnership could help their mission. They have since replicated this strategy across a number of industries. The panel emphasized the importance of integrating impact and thinking critically. McWhorter said, “You’re always making an impact,” so it is important to teach students from day one to consider whether that impact is good or bad. View photos in the gallery below or on Quinlan’s Flickr page.